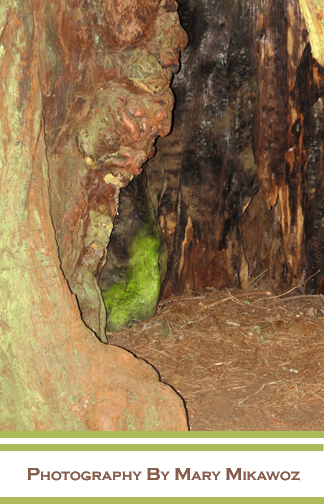 I took this photo of the inside of a Californian Redwood tree and I found it remarkable to see the profile of a face. It is a strong side view of a face with a forehead, an eye, nose and chin going down into a neck. Can you see the image in the wood? It is gnarled and old yet somehow very strong as a male figure. I enjoy the browns, greens and other hues found in the wood. As well, I think the moss near the bottom of the face is an incredible green neon shade which is amazing to me because it naturally occurs in nature. It has been awhile since I have loaded up some photos and I must say that it feels as if a part of my soul has been missing out. 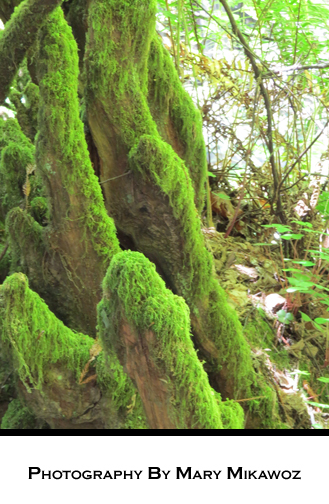 Here is an image of green moss found on the famous redwood trees of Muir Woods near San Francisco. These trees are part of the Golden Gate National Recreation Centre on the Pacific Coast. According to Wikipedia, “Before the logging industry came to California, there were an estimated 2 million acres (8,000 km2) of old growth forest containing redwoods growing in a narrow strip along the coast.” Many of the trees have disappeared except for a small section of these redwood trees that were set aside by William and Elizabeth Kent.